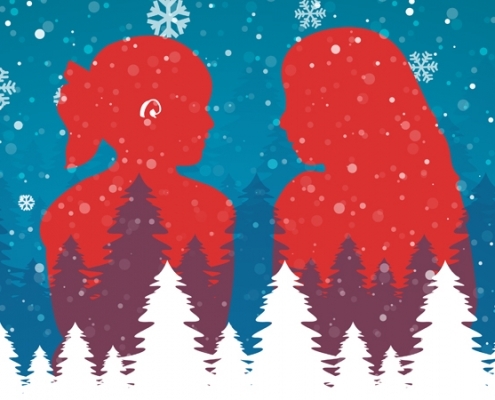 The post Friendly advice: Encouraging parents to help their child with hearing loss develop friendships appeared first on Central Institute for the Deaf. As professionals, parents often approach us with concerns about their child’s social life. One common concern is that their child is struggling with friendships. Sometimes this is voiced as, “I don’t know how to help my child make friends.” Sometimes this is unvoiced and hidden within a statement, “I guess some kids just like to be alone.” No matter how a parent phrases it, the underlying concern is that their child is, or will be, isolated and alone. Knowing that friendships add rich and valuable dimensions to our lives, we can certainly understand a parent’s concern. We can address these feelings and fears by providing them with the following tips and strategies. Parents need to also recognize that some children have an introverted or shy temperament. These children may need additional support and encouragement in building friendships. 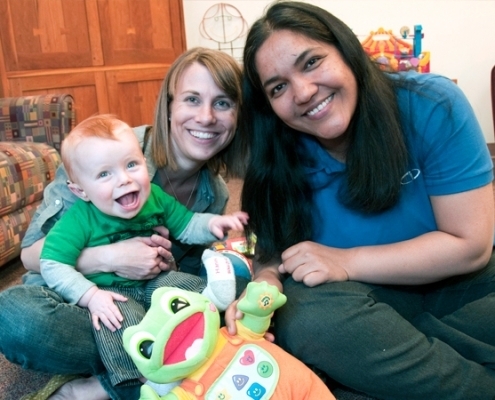 Understand how a child’s hearing loss may impact the development of friendships. Many children with hearing loss have delays in language development that can impact their ability to initiate or maintain friendships. Teach parents about this impact. For younger children, the impact may be less noticeable because play is less dependent upon language. This impact can become more apparent when children reach the stage of development in which play is based upon the child’s ability to share ideas and negotiate with others. For this reason, some children with hearing loss may feel more comfortable with younger playmates or with one friend rather than in a group. Some children respond to the challenge by choosing play activities that are less language-dependent, such as assembling puzzles, playing tag or creating art projects. Typically, as children’s ability to communicate develops, their ability to initiate and maintain friendships progresses as well. Plan for play dates. Encourage parents to plan play dates. They can plan the play date with a child with similar interests as their child. For children first learning how to play together, structured, closely supervised and facilitated play dates for short periods of time work best. A parent might invite another child over for an hour to play trains or to do a specific project, like making cupcakes. If the play date is in the home, suggest that the child put away favored toys that he may not be ready to share. As friendships evolve, the child will be able to move from a pre-planned, structured activity (making playdough) to creating their own play plan (playing pirates in the backyard). Eventually, with the growth of the child’s skills and confidence, he will progress from play dates with one child to a small group of children with less facilitation. Urge parents to acknowledge and encourage their child’s effort with using these social skills. They can also draw their child’s attention to situations in which someone else was kind. For more, here is a link from Scholastic with a list of social skills by age and how you can encourage them. Teach their child to understand their hearing difference and how it impacts them. Teach them the name of their device, how it works and why they need it. As appropriate, they can help their child learn to share their hearing difference with their friends. This not only empowers their child to take ownership of their hearing difference it also demystifies this difference for their friends. Bonus Tip: Some children may need to be made aware of and informed about things that are interesting to other children their age. For example, if Paw Patrol is the hot topic among children their age, encourage parents to watch this with their child and help them to learn the names of the characters. If children their age are interested in Minecraft, a parent can help their child learn the rules and language associated with the game. We all need friends. Friends provide an added dynamic to relationships that parents, and even siblings, can’t offer. Friends are playmates and companions who provide support and affection. We can be a friend to parents by addressing their concerns and helping their children develop friendships. Patti Hoffman is a Family Resource Specialist at CID— Central Institute for the Deaf and also serves as an Early Childhood Educator in the Anabeth and John Weil Early Childhood Center at CID. 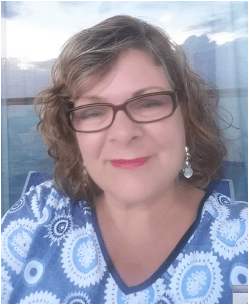 In her role as Family Resource Specialist she helps staff and families find community resources that support their needs, facilitates a family connection group and organizes events for families. Hoffman has a BA in Early Childhood and Elementary Education and an MA in Counseling and School Counseling. She has presented workshops at CID as well as at professional conferences, written an article for Volta Voices, guest lectured for the Washington University Program in Audiology and Communication Sciences and compiled the CID Developmental Rating Forms for children ages 3-5. Hoffman has been a member of the CID staff since 2005. 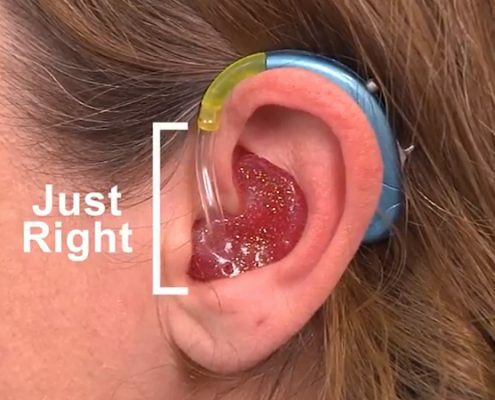 The post All waking routines: Helping families achieve full-time hearing device use appeared first on Central Institute for the Deaf. 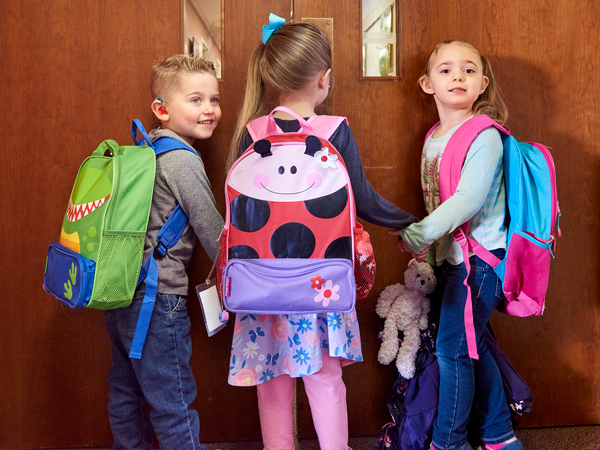 Picture this: A family leaves a pediatric audiology appointment equipped with their child’s new (unfamiliar, expensive) hearing device/s, a bag filled with related equipment and the audiologist’s recommendation to keep the device/s on during all waking hours. For many families, the task of achieving full-time hearing device use feels initially overwhelming. While some have quick success, others struggle. When these families return for their next audiology appointment, they may flash a look of disappointment upon receiving the data-logging results that confirm what they already know: Their child is not wearing her device/s during all waking hours. If you work with a family who is having difficulty working toward full-time hearing device use, consider helping them shift their focus away from the hours and instead toward their routines. Gather information. Ask parents and caregivers to talk about situations and feelings that might be barriers to their child’s hearing device use. Ask reflective questions that prompt them to recognize strategies they have found successful. Discuss the impact of maintaining consistent expectations. For example, insisting a child wear hearing aids at lunch and dinner when she doesn’t have to wear them at breakfast might send a confusing message. Suggest committing to one or two daily routines at a time. This should feel more attainable than suddenly mastering full-time device use. Ideally, success within one activity provides motivation to commit to another, and another, until the child is wearing her devices during all waking hours. Allow the family to take ownership as they choose which routine/s they want to tackle first. If they can’t decide where to begin, you might tell them it’s helpful to start with a time of day when their child is generally in a good mood. Some families prefer to begin with the morning routine in an effort to set the tone for the rest of the day. Others prefer to start with a time of day that has especially rich language, such as book time, or when their child’s hands are busy, such as meal time. Still others find that experiencing success within a short routine, such as diaper changes, motivates them to move forward and continue checking off activities from the list. Once families develop a plan, be sure to check with them periodically to see how the plan is going — and where they want to go next. We’re all familiar with tips for increasing our daily activity level: Choose the parking spot that’s farthest away from the door. Take the stairs instead of the elevator. Go on a walk at lunch. Get up and move during commercial breaks. We do these things because we know the steps add up. It’s the same with hearing device use: the minutes add up, too. Sure, a half hour may not seem like much in the context of an entire day, but over the course of a month, that daily 30 minutes adds up to 15 valuable listening hours. Children learn language through experiences. Outings provide valuable listening opportunities and exposure to novel language. Retention items such as clips, headbands, pilot caps and wig tape can offer parents peace of mind during time away from home. Safely storing the hearing device/s in the child’s bedroom overnight might give parents a visual reminder to put the device/s on first thing in the morning. It’s important that all caregivers understand the importance of wearing hearing devices – and how to care for them. Pediatricians urge parents to limit screen time. Parent interaction is the best way to help a toddler listen and talk; however, if a child does spend time in front of a screen, her hearing device/s can provide better auditory access to sounds, music, speech and spoken language. A reward chart can be an effective positive reinforcement tool for some children, depending on their age, temperament and understanding. Parents can use stickers, stamps or drawings to mark and celebrate their child’s accomplishments. Click here to download CID’s free, routines-based All Waking Activities Log for parents. Find this and other useful resources in CID’s new curriculum for infants and toddlers with hearing loss, Early Listening at Home. The curriculum includes the handout, Sweet Success! Using Daily Routines to Support Listening and Talking, Strategies for Achieving Full-Time Device Use and a companion tracking tool for professionals. Manley, J., Odendahl, J. & Samson, M. (2019). Early Listening at Home Curriculum. St. Louis, MO: Central Institute for the Deaf. Megan Samson is a parent educator in the Joanne Parrish Knight Family Center at CID, credentialed in Missouri and Illinois. 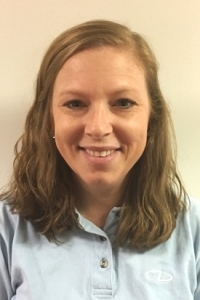 She has been a member of the CID teaching staff since 2011, initially working with preschoolers in the Anabeth and John Weil Early Childhood Center. Megan co-authored the CID Early Listening at Home (ELH) curriculum. She also helped develop activities for CID SPICE (Speech Perception Instructional Curriculum and Evaluation) 2nd edition and CID SPICE for Life and has presented workshops on auditory learning at CID. The post Spelling is a language skill appeared first on Central Institute for the Deaf. I really appreciate the gift of spell check on my computer, but sometimes I find auto correct on my cell phone to be both frustrating and dangerous! There is no denying that all of these tools can support accurate spelling, but they are not a substitute for the ability to spell. Spelling remains a critical skill despite these technology supports. If students struggle with spelling, they end up concentrating on writing the individual words rather than thinking about how to organize and express their ideas. It is critical that we support our students in becoming more successful spellers. Spelling used to be considered a rote and mechanical memory skill. More contemporary research shows that spelling is actually a highly sophisticated language skill. Wait, what? A language skill? Yes. Spelling is a language skill. Brain and behavioral studies document that good spellers effectively integrate multiple areas of language. The language domains of phonology, orthography and morphology are particularly important. Now we’ll take a deeper look at each of these areas of language. Let’s consider that we want to spell the word “cooked”. Good spellers draw on phonology, or their knowledge of the sounds that make up the English language. Spellers learn how to break up a word into its component sounds in order to represent them all in the spelling of a word. For example, to spell the word “cooked” you need to recognize it includes the sounds “k” “oo” “k” “t”, and that those sounds occur in that order. Second, good spellers use orthography, or their knowledge of the rules for representing sounds with letters. Spellers learn that each sound can be represented with certain letters and that some letters can only occur in certain places of a word. For example the sound /k/ can be written by “c”, “k” and “ck”, but “ck” cannot be used at the beginning of a word. Finally, good spellers integrate their morphology, or their knowledge of the smallest meaningful units of language. For example, the word “cooked” includes the root “cook” and the past tense marker “ed” (even though the “ed” sounds like a “t”!). 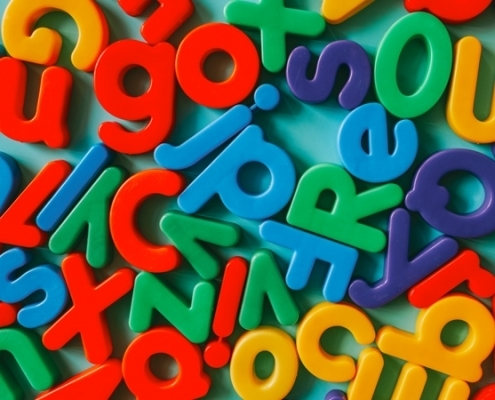 In the background of our brain, a lot of language is happening when we spell a word! 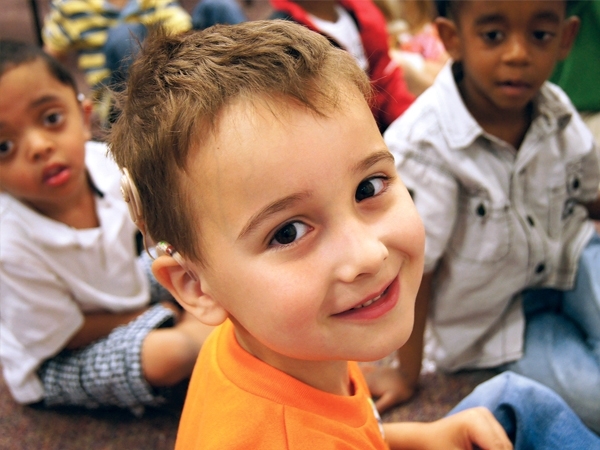 Language development is challenging for many of our students with hearing loss. It shouldn’t be surprising that students with hearing loss who struggle with language, may also struggle with spelling. We are still working to understand more precisely why some of our students struggle with spelling. Historically the spelling tests we have used to assess spelling simply evaluated words as being correct or incorrect. This assessment approach does not help us identify underlying areas of weakness or guide intervention. More recent approaches in assessing spelling involve analyzing the kinds of spelling errors that students write. By describing the errors, we can begin to infer if there are particular areas of weakness in one or more domains of language. One of these spelling error analysis tools is the POMplexity for Roots and Affixes (Quick & Erickson, 2018). This tool was developed to assist educators and speech-language pathologists in categorizing spelling errors according to the language domains of phonology, orthography, and morphology. The reason the name includes “Roots and Affixes” is because the spelling errors are examined both at the whole word level and among the individual meaningful units of roots, suffixes and prefixes. Please see Appendix A & B for the scoring criteria and a scoring form for the POMplexity for Roots and Affixes. The POMplexity for Roots and Affixes was used to examine over 30,000 words spelled by students with hearing loss. 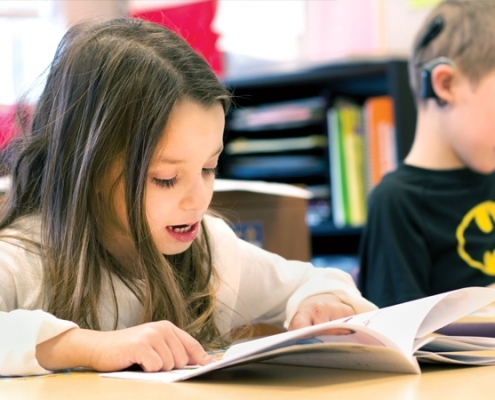 In one study, the writing samples and misspelled words were compared between 9 students with cochlear implants (CIs), 9 students who are hard of hearing, and 9 students with typical hearing (Quick, Harrison, & Erickson, 2018). Across the three groups, there were no differences in the percentage of words misspelled in their writing samples. However, there were some differences in the patterns of errors. Children with CIs showed some spelling strengths in spelling vowels in words (orthography) and in spelling words that sound the same (morphology; e.g., “write” vs. “right”). These strengths suggest that children with CIs may capitalize on their visual skills when spelling words. Children with CIs also showed some weaknesses in capturing word endings such as “s”, “ed” or “ing” (Morphology; e.g., “He walks”, “She walked”) or representing all of the sounds of a word in their misspellings (Phonology; e.g., write “back” for “black” and omit representing “l”). These weaknesses suggest that children with cochlear implants may have auditory weaknesses in encoding all of the sounds in words or the end parts of words. These weaknesses are likely due to their restricted access to spoken language. In another study, the writing samples and misspelled words were compared between 142 children who are hard of hearing and 72 children with typical hearing (Quick, 2017). While children who are hard of hearing had fewer misspelled words in their writing samples, they also selected to write words that are more frequent in written English. These results may indicate that children who are hard of hearing have a weakness in vocabulary, or this may indicate that they struggle with spelling and therefore choose to write words that they are more confident in spelling. Children who had poorer aided hearing also had more errors in the domains of phonology and orthography. These results suggest that we must continue to be vigilant in making sure that our students have working hearing aids and that those hearing aids are properly fit! In summary, students with hearing loss are at risk for struggling with language; therefore they are also at risk for struggling with spelling because spelling is a complex language skill. However, students who struggle with spelling are not subject to remain “poor spellers”. In the same way students with hearing loss can continue to grow their language skills, they can continue to grow their spelling skills. 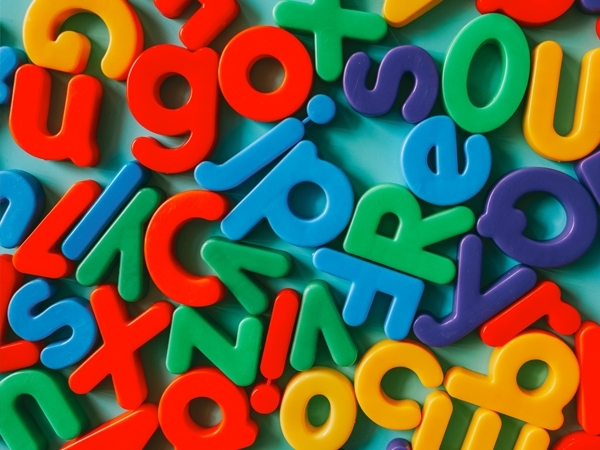 Spelling error analysis empowers teachers and speech-language pathologists to identify a student’s individual strengths and weaknesses in the domains of language that support spelling. Armed with this information, educators can leverage areas of strength while also targeting intervention to areas of weakness. Together, we can all work towards making sure that our students with hearing loss become better spellers so they can increasingly focus more energy on organizing and expressing their ideas in ways that enrich our classrooms, their lives, and our society. Then they will also be able to develop their own non-codependent, love-hate relationship with spellcheck and autocorrect along the way. For more support, click here to download additional appendices. Quick, N. (2017). A multilinguistic analysis of spelling among children with hearing loss. (Doctoral dissertation). Retrieved from Proquest Dissertations and Theses Global. (Order No. 10268676). Nancy Quick is a Research Assistant Professor at the Center for Literacy and Disability Studies at the University of North Carolina at Chapel Hill. As a speech-language pathologist, she works with children who are deaf and hearing and their families. Her research interests include language and literacy development among children with hearing loss. The post Bridging the gap from school to home: Effective coaching strategies to be used with parents and caregivers appeared first on Central Institute for the Deaf. When working with young children who are deaf and hard of hearing, it is important to remember the crucial role that parents and caregivers play. They are a child’s first and most important teacher and supporting them is equally as important as supporting our students. One method that can be used to support parents and caregivers is coaching. Coaching can be especially helpful in bridging the gap between home and school. It provides immediate, direct feedback and praise to the caregiver during a session with the child in order to help the caregiver to promote language outside of the classroom. Use an open-ended comment to guide the caregiver into trying a new technique. Provide direct instruction to the caregiver within the activity. 3. Provide the parent/caregiver with non-verbal cues. We often use visual cues to steer students into the right direction, and the same can be done with parents/caregivers. Some examples of non-verbal cues that can be used are a head nod, an eyebrow raise or an expectant look. Give the parent/caregiver examples of what they can do or say next. This can not only ease any hesitation but also sets them up for success. 5. Be a Sports Announcer. Narrate the actions of the parent/caregiver or child. Point out when you’ve missed something that the parent/caregiver didn’t. Specific: What did they do that was good? Immediate: Give them the praise at the time they did it. Informed: Why was it good that they did what they did? Most importantly, remember that all caregivers learn in different ways, and some will respond better to certain strategies than others. Be sure to change your strategies based on the unique needs of the caregiver. 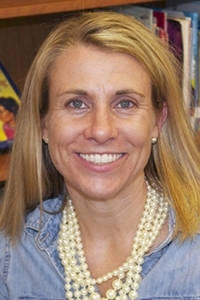 Audrey Nemeth has been working as a Teacher of the Deaf for twelve years, serving primarily children ages three-five at CID, as well as at the Moog Center for Deaf Education. She has taught a variety of language levels, and the importance of vocabulary, repetition and speech development can be observed in every lesson she teaches. In addition to teaching children with hearing loss, Audrey provides parent/caregiver support on a weekly, bi-monthly, and monthly basis. These sessions consist of: presenting information about hearing loss; discussing strategies, techniques, and activities for helping parents teach their children to talk, and providing embedded coaching to parents to improve their child’s communication skills. Audrey also has a passion for teaching other professionals. For the past nine years, she has provided supervision and mentorship to student teachers from a variety of universities. 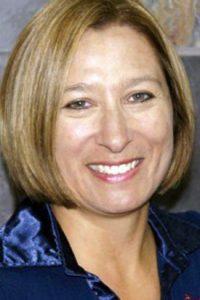 The post Stumped by the SPICE: Answers to the SPICE curriculum’s most frequently asked questions appeared first on Central Institute for the Deaf. 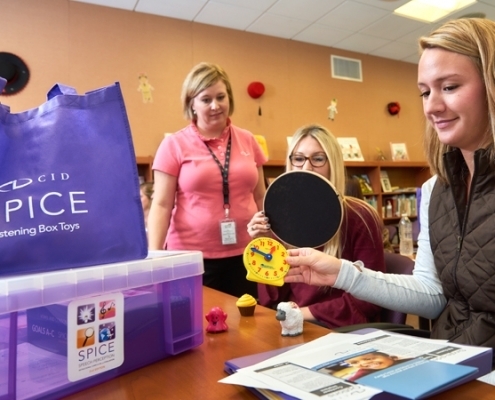 The Speech Perception Instruction Curriculum and Evaluation (SPICE) is a widely-used auditory training curriculum developed at CID to support professionals in developing listening skills in children with hearing loss. The SPICE is a valuable tool for evaluating a student’s current auditory skill level, planning listening activities, charting growth and then reporting to parents and professionals. Though the SPICE is user-friendly and contains a detailed user manual, there are, naturally, still questions that arise when professionals begin to, or get further into, using this curriculum. Below are answers to some of the most frequently asked questions regarding the SPICE. How many students can I have in a group for auditory training? Ideally, auditory training sessions are conducted in a one-on-one setting (one professional: one student). We do, however, recognize that this is not always possible. In those instances when a student needs to be paired with another student(s) we suggest that the students are at similar auditory skill levels. We would also recommend that you not have more than 2-3 students in a group. What often occurs when group sizes increase is the amount of “down time” for students also increases (e.g., while each student takes a turn performing a task, the other student(s) is waiting and not engaging in a productive activity). Why would I perform auditory training tasks using only one device? The SPICE Rating Form contains three columns: one marked with an “L” for left, one with an “R” for right and one with a “B” for both. Although best practice is to perform auditory training tasks using both of the student’s devices (if they are bilateral or binaural users), there are certain instances in which you want to assess listening skills with one device only. The most common instance of this is when a student has recently received a new device. Auditory training tasks should then be done at that ear alone in order to train the student’s brain to listen using the new device. You may also want to engage the student in ear-specific tasks if they are not yet good reporters of when a device is not working. I have been using the SPICE with one of my student’s for a while now. He can’t move past the (insert specific section). What should I do? Is the task above his language-level? The student may be able to hear the words that are being presented, but they are possibly unfamiliar to him. Be sure the words that you are presenting are known and familiar to the student. This will ensure that you are truly measuring auditory skills and not vocabulary skills. Are they engaged in the activity? Some students may find the structured nature of the SPICE tasks tedious. Consider ways to make the activities more motivating to ensure that behavior is not impacting responses. Some ways to do this include: playing a game (e.g., Bingo) with the target words, providing frequent reinforcers (e.g., stickers, tokens, stamps) and using toys/items of interest for following directions. Does the student have auditory access to the sounds within the words/phrases/sentences being presented? When a variety of other factors have been considered, it is likely that the student does not have the access to sound needed to perceive the presented stimuli. Talk with the student’s audiologist. If the student is unable to hear the sounds, this could indicate: a shift in hearing, a broken device, the need for re-programming or the need for a different device. If you have other questions regarding the SPICE curriculum, or any of CID’s products, please contact us at: professionaldevelopment@cid.edu. 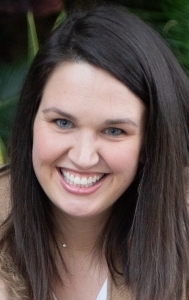 Jessica Klein began working as a speech-language pathologist at CID in 2004, assessing and treating children from birth-age 12. 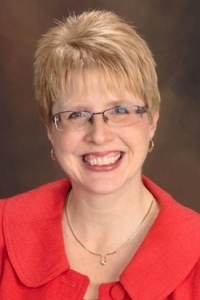 Klein co-wrote the “Targeting Speech Skills for Children Who Are Deaf and Hard of Hearing” workshop, presenting annually at CID as well as at Southeast Missouri State University and at the Missouri Speech and Hearing Association conference. In 2011 she accepted a job as a speech language pathologist in one of St. Louis’ charter schools. While in the public school setting, Klein assessed and provided speech and language services to students in kindergarten-fourth grade with varying speech and language needs. She was a member of the school’s CARE team, collaborating with teachers and specialists to develop interventions for students struggling in the classroom. 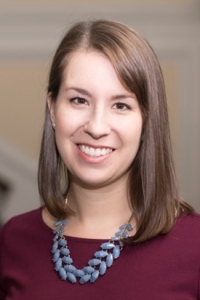 In 2015 Klein returned to CID ready to share her public school experiences with colleagues to help better prepare CID students for the mainstream setting. Since her return, she has written an online course about developing literacy skills in children who are Deaf and Hard of Hearing as well as spoken about literacy skills and case managing Deaf and Hard of Hearing students at Fontbonne University. She currently serves as the Associate Coordinator for the CID Emerson Center for Professional Development. 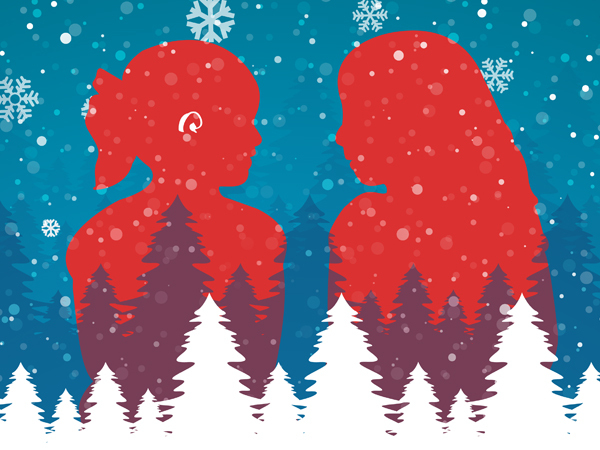 The post Not so silent night: Ways to elicit language during the holiday season appeared first on Central Institute for the Deaf. There is no denying that the holiday season is upon us. There are decorations around each corner, our email inboxes are being flooded with news of holiday sales and our pants may be a little tighter due to that “one last cookie” we’re going to eat. Along with the merriment that the holiday season brings, it can also bring added stress to our often already crazy lives. With all of the extra tasks that we are faced with doing, encouraging the development of language skills in our children may go on the back burner during this hectic month. But it doesn’t have to. Below are some common holiday traditions done in many homes, along with ideas for how to incorporate listening and language skills while completing them…and bonus: by asking your children to engage in these tasks with you, you’ll get some extra help! To start, have your child think of all of the ingredients that you may need for the recipe. If cookie cutters are being used, this is a great way to target vocabulary: a star, an angel, a bell, a stocking, etc. And if the cookies need some decorating, the possibilities are endless: prepositions (“where should we put the icing?”); adjectives (“which sprinkles would you like, the red ones or the shiny green ones?”); quantifiers (“would you like a little or a lot of sprinkles?”), and verbs (e.g., “we need to spread the icing and then shake the sprinkles”)… just to name a few. The holiday season can also, hopefully, mean extra time spent with family and friends. Remember that any time spent talking with your children, regardless of what you are doing, is beneficial. It is also crucial to remember, especially during a season that emphasizes material objects, that you don’t need fancy toys to elicit language. Happy holidays! 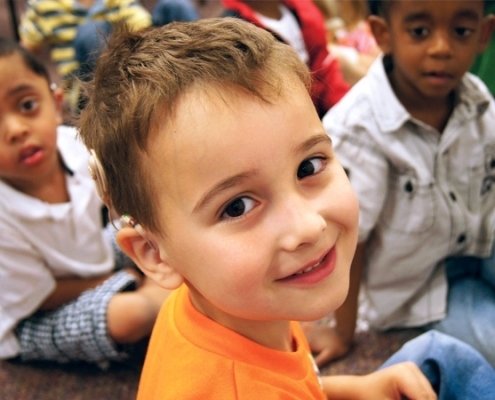 The post Practice brief: Serving children with hearing loss who have been adopted and their families appeared first on Central Institute for the Deaf. 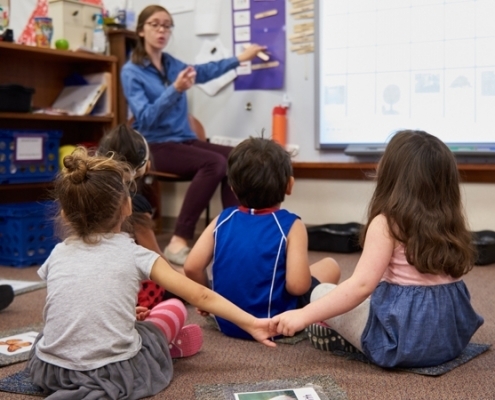 Our research team in the Program in the Education Deaf Education at Teachers College, Columbia University recently conducted a qualitative investigation on the experiences of parents who have adopted children with hearing loss. Below, we share several key findings and resources that professionals can use to serve these exceptional children and their families. Positive adoption language. As communication disorders professionals, we understand the power of words. Common terms like, “real parents,” or “natural child” carry hurtful implications for children who have been adopted and their parents. You can find more information on respectful alternatives to old adoption-related terms at bit.ly/posadoptlang. Adoption-sensitive classrooms. Common classroom activities, such as Father’s Day/Mother’s Day projects, creating a family tree, mapping family genetics, or sharing baby pictures and memories, may be difficult for children who have been adopted or in foster care. Consider alternatives, like allowing children to create a gift for any special person in their lives, making a collage of important people in their lives, using animal models for genetics lessons, or sharing fun facts or hidden talents rather than baby pictures. Additionally, while some children may be eager to share their adoption stories and, if adopted internationally, stories of their birth culture, not all children are eager to serve as poster children for adoption. As in all things, follow the child’s lead and avoid putting students on the spot. Including materials (dolls, dollhouse characters, books, etc.) that represent a variety of ethnicities and family configurations can help create a classroom environment that is welcoming to all. Trauma-informed care. Most importantly, practitioners must be attuned to the profound influence of trauma on the developing brain. While many children who have been adopted are now in nurturing families, early experiences of institutionalization, separation from a primary caregiver, stress, material deprivation, and potential abuse leave lasting scars on the developing brain. These effects of trauma may show up in various ways in the classroom: as language delays (above and beyond those attributable to hearing loss), sensory and emotional regulation challenges, and a fight/flight/freeze response to triggering situations. Trauma-informed care prompts us to ask, “What happened to you?” instead of, “What’s wrong with you?” when confronted with a challenging behavior. Eager to learn more? Check out our complete article in the November 2018 issue of The Hearing Journal, and contact us if you’d like to participate in future research! Elizabeth Rosenzweig MS CCC-SLP LSLS Cert. AVT is a Speech-Language Pathologist and Listening and Spoken Language Specialist, Certified Auditory Verbal Therapist in private practice. She works with families around the world via teletherapy and writes on all things hearing loss on her website: www.AuditoryVerbalTherapy.net. 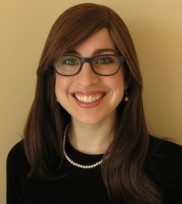 Elaine Smolen is a doctoral student and National Leadership Consortium in Sensory Disabilities (NLCSD) scholar at Teachers College, Columbia University. Prior to beginning her doctoral studies, Elaine was as a head teacher at Clarke Schools for Hearing and Speech/New York. She currently provides hearing education and consulting services in the New York area. Elaine received her MAT in deaf education childhood education and English from The College of New Jersey. 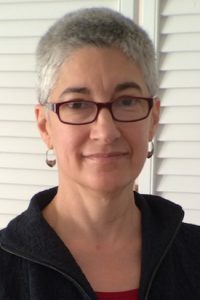 Maria Hartman is a Lecturer in Program in the Education of the Deaf and Hard of Hearing at Teachers College, Columbia University teaching courses in language and literacy development as well as assessment and methods courses. She is also the Coordinator of Student Teaching, supervising pre-service students in schools and programs throughout NYC. Previously, Maria was a classroom teacher in a school for deaf children in Brooklyn, NY. She serves on the CID Professional Development advisory council. The post Speech-Language (and Literacy?) Pathologists appeared first on Central Institute for the Deaf. 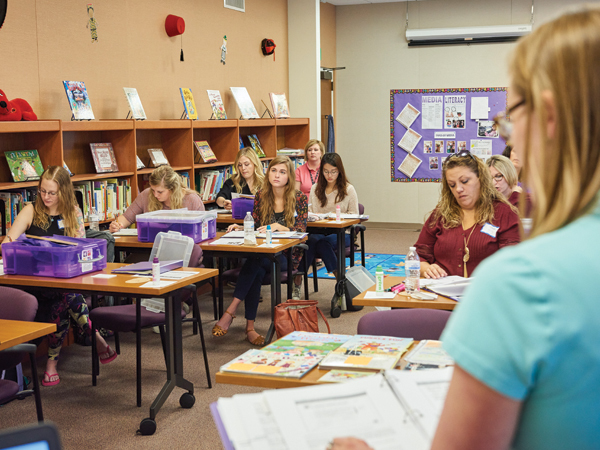 Speech-language pathologists (SLPs) are busy. Their caseload numbers are high, their list of students in need of an evaluation is continually growing, and IEP meetings are often dispersed throughout their day. They are targeting goals for speech, language, social skills and auditory development. So asking them to address literacy skills, too, seems absurd. Or is it? To become efficient readers, students must develop two sets of skills: code-based skills and meaning-based skills. Code-based skills include those skills necessary to “learn to read,” including, phonological awareness, alphabetic knowledge and print concepts. Meaning-based skills include those skills necessary to “read to learn,” such as, vocabulary knowledge and language comprehension. Both sets of skills are rooted in speech and language, and both are skills that likely are already being woven into sessions with SLPs. It is easy to see how SLPs are supporting the meaning-based skills of reading. Targeting vocabulary and teaching the syntax of language are being addressed with many students throughout the SLP’s day. The vocabulary being reinforced in sessions with SLPs likely even comes straight from text that is being taught in the classroom. What isn’t always as obvious is how SLPs are supporting the code-based skills of literacy. The term phonological awareness refers to one’s ability to manipulate the sounds of a language. It encompasses a variety of skills, including, rhyming, counting syllables and phonemic awareness. Phonemic awareness can then be broken down even further into the skills of being able to isolate, blend, add, delete and substitute sounds. When SLPs work on articulation goals with students, regardless of the student’s level (producing a target sound in isolation, within a word, or in a sentence), the following progression often occurs: the target sound is produced in isolation; the target sound is blended into a word, the awareness of what sound should not be substituted is addressed. This sequence of events, while necessary to meet articulation goals, is also supporting the development of phonological awareness, a key component in learning to read. SLPs are busy. They are targeting speech and language and all of the many skills that fall under the umbrella of these two terms. They are writing goals, planning lessons, attending meetings and more. They are supporting literacy… and they might not even realize it. The post Teaching the teachers: The importance of continuing education appeared first on Central Institute for the Deaf. The times they are a changin’ (and have been changing) in the field of deaf education. Today, more and more students who are Deaf and Hard of Hearing are being taught within the regular classroom in a mainstream setting. This is for a variety of reasons, including: the passing of the Individuals with Disabilities Act (IDEA), increasing technologies (e.g., cochlear implants, FM systems) and a wider variety of professionals available to support students with hearing loss (e.g., interpreters and paraprofessionals) (Foster and Cue, 2009). With this shift in student placement, comes the need for teachers of the deaf to shift their way of teaching. 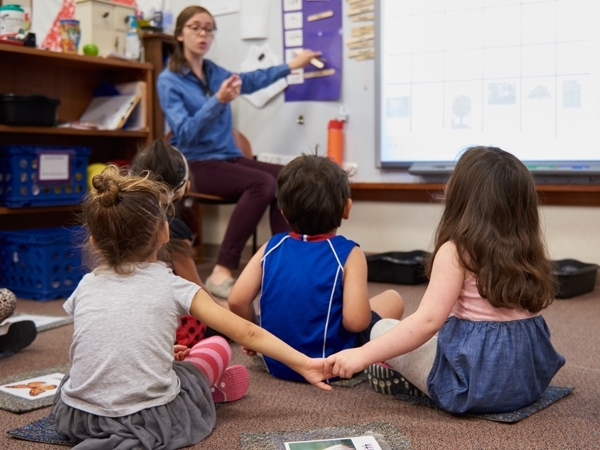 Whereas in the past, teachers of the deaf were trained to provide direct instruction individually or to a small group of students, they are now often required to provide consultative services for general education teachers (Foster and Cue, 2009). These consultative services can include: providing strategies for working with students with hearing loss, offering instruction about reading audiograms and handling devices, and planning lessons alongside the general education teacher. And although it is encouraging that students with hearing loss are being included in the general education classroom, the preparedness of teachers of the deaf to assume this changing role should be considered. A study conducted by Susan Foster and Katie Cue found that of the skills that itinerant teachers of the deaf are expected to use on a daily basis, only 17% of these were learned in educational preparedness programs; a majority of them (65%) were learned while on the job. These statistics raise the question of, how can we better prepare professionals before they enter the field of deaf education, as well as reiterate the need for consistent and ongoing continuing education for those professionals already in the field. With technological advances and new legislature, not to mention serving students with additional diagnoses, deaf education is continually evolving. And with continual changes, comes the need for continual learning. If we want students to reach their full potential, we must reach ours, too. Let CID help with your continuing education needs. Click on this link for information about our professional development offerings. The post The early bird gets the worm: Using the ESP to support early listeners’ language skills appeared first on Central Institute for the Deaf. How early is too early for speech perception tasks? With the CID ESP – Early Speech Perception test, the early language learner can be an early bird. 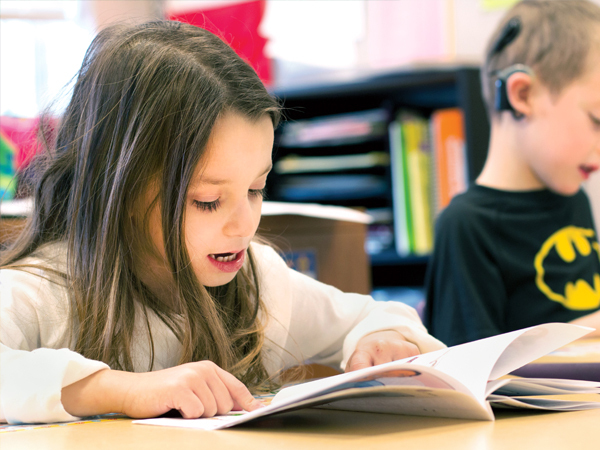 The CID ESP is a flexible tool for estimating the best strategies for the inherently challenging, young language learner to move through auditory training. The secret to identifying early language objectives is in the play. First, let’s break down the formal ESP: In clinic, the CID ESP is a speech perception measure now included in the hierarchy of the Pediatric Minimum Speech Test Battery (PMSTB) protocol. ESP test validity was obtained with children who were 4 to 15 years old and had a pure tone average in the profound range. It wasn’t the age of the child that mattered – but the level of language experience and auditory training with visual, auditory + visual and auditory-only methods. The ESP standard version employs a point-to-picture task for older children. The ESP low-verbal version requires the child to manipulate toys. These two testing methods enable you to work at a language level appropriate to the childIf the child can complete the standard or low-verbal ESP method, then read the manual! The methods of moving through pattern perception skills to monosyllabic word discrimination are outlined well there. 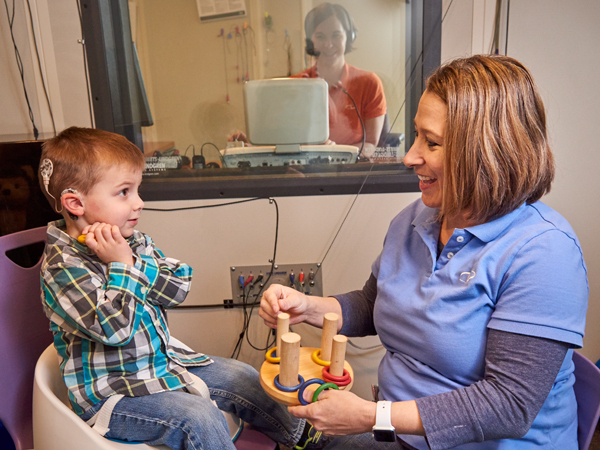 As a result of mandated newborn hearing screenings, many children enter today’s audiology clinics at a much younger age. Accordingly, these children may not have the language or cognitive skills to complete formal speech perception testing. When early identification and access to language supports lead a child to your audiology clinic before he is old enough or mature enough to do the ESP test, you will likely want to postpone formal speech perception tasks. The ESP provides alternative methods for test administration at such a child’s skill level. The ESP offers fun training activities that can be used as a precursor to formal speech perception testing. Use it informally as soon as the child can learn the conditioned play task. As long as they have emerging play and wait skills, children at or under 2 years old can play through the training tasks. These tasks are highly flexible and great for collecting data to get to a starting point for auditory training and/or to show informal effects of auditory training. The toys in the ESP kit can provide much-needed sensory experiences that keep a child engaged, particularly in cases where rote speech perception tasks do not. Selecting toys based on the child’s familiarity with them makes the task more meaningful than repeating words like “mew” (shout out to CID’s W22 list for adults!). A child with early or emerging language skills may begin the auditory training experience with markedly dissimilar sound patterns and progress to more difficult discrimination tasks as his language sophistication grows. The cues you give prior to the beginning of the test can help determine if the item is familiar to the child. Consider using supports such as lipreading and other visual cues in the beginning, especially to help identify familiar items. The ESP training tasks could begin with playing at pattern perception in live voice. An audiologist may have the child move a train toy toward a toy bucket when he hears a continual /ah/ sound — or encourage the child to jump a bunny into a bucket after hearing a staccato “hop hop hop.” Playing within a small set of two items can be motivating for a child with early verbal skills! Modifying the training task and keeping it fun may be the catalyst he needs to identify stimuli differences and begin the journey to formal speech perception testing. 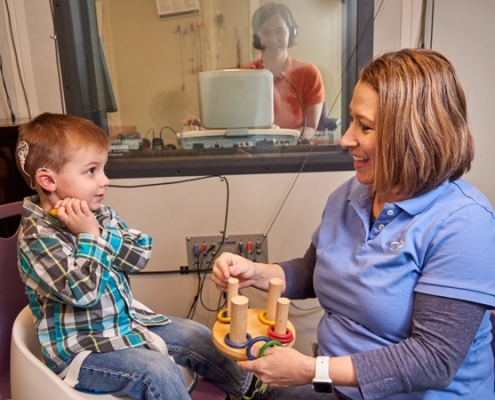 As audiologists, we want auditory training to build success toward developing language skills. Use a visual or auditory sandwich strategy to familiarize the child with each task. Try using bone oscillator vibration or hand-over-hand on the throat, paired with voice to accentuate the pattern lengths. Start with monitored live voice (and grab a play microphone if you can!). On the path toward more formal testing, transition from live voice toward monitored live voice then recorded stimuli. Move around the room or sit on the floor while training informally. Movement may encourage participation. Engage parents/caregivers in the training task. Build upon the time spent in the task: The formal ESP may take 20 minutes, but you can start with 5 minutes in training! Pair the pattern differences with tactile movement along the child’s arm. 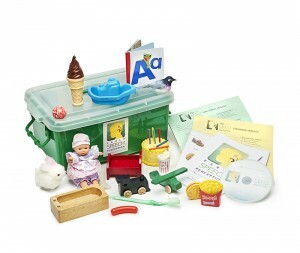 Allow older children to choose the toys in the set or to use a pointer with the picture cards. They may even find pictures in magazines to use. The end goal of obtaining formal speech perception data remains the same. In the early stages of language learning, an informal approach to the ESP can playfully lead steadily toward category 4 discrimination of pointing out monosyllabic differences such as “bird” versus “ball.” After all, a task that starts out as fun may end up building language. Click here to learn more about the ESP.